Hurray! It’s Friday and time for the Friday Friend Giveaway. Today, my guest is Holley Gerth. Holley is a precious soul, and one of my prayer partners. She can often be found at a quiet corner table in a coffee shop with a hot latte and her banged up, beloved laptop. She’s the Wall Street Journal bestselling author of You’re Already Amazing and several other books as well as a counselor and life coach. Today she’s sharing from her newest book, Fiercehearted. You’re going to love her. I do. Are you facing something scary today? 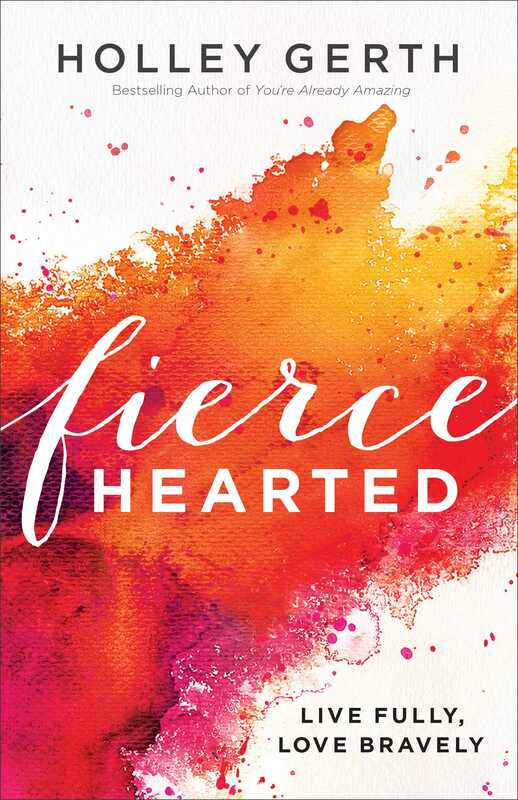 If this devotion has helped you face it like the fierce hearted woman God created you to be, then leave a comment to say, “I’m a fierce hearted woman!” We’ll randomly choose one comment to win a free copy of Holley’s book, Fierce hearted: Live Fully, Love Bravely. Every day we struggle to find more freedom, joy and purpose. What if the solution isn’t trying harder or being better but embracing the fiercehearted woman already inside us? 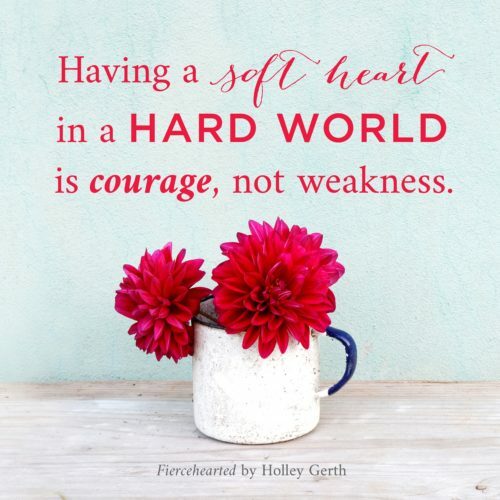 In her most powerful and personal book yet, Holley empowers and encourages women not simply through “how to” but by life-changing, heart-freeing “me too.” Join Holley on this journey to becoming a fiercehearted woman and discover what she did: the freedom and courage to embrace life, love, and faith to the fullest because your struggles can no longer hold you back. Congratulations to Betty Martin who won a Free copy of Suzie Eller’s book Come With Me. Congratulations to Jill Calloway who won a Free copy of Chrystal Evans Hurst’s book, She’s Still There. I’m a fierce hearted woman! Karen, I agree 100% !! I am a fierce hearted woman. I have been encouraged that I am not the Only One going through whatever I am going through. I’m a Fierce Hearted Woman.. at least I want to be and need to be bc life is REALLYTOUGH right now. Yes, I hear you, Sandy! You definitely aren’t the only one having a really rough life right now…me too! Let’s hang in there knowing the Only One has us in His hands. I’m constantly reminding myself to lift my eyes to Him! Even though I know in my head I’m not the only one, sometimes my heart says I am. I am definitely a fierce hearted woman!!! I’m a fierce hearted woman who is so happy that I’m not the “only one” and is thankful to be reminded I’m not the ONLY ONE. Happy Friday. I’m not the only one…sometimeso you have to do it afraid! This year has been the “just do it “year for me.With so much change and differences come lots of heavy emotions. Thanks for reminding me that I am not the only one dealing with “things ” in this world! Wow, such a powerful message. Thank you, Holley, for sharing from your heart, and thank you, Sharon, for sharing Holley with us! Breast cancer is not going to get the best of me! I have already Overcome by the blood of the Lamb and the word of my testimony! I’m a firece hearted woman! I needed that reminder as well. So much craziness from my oldest sister is going on right now. Still it is in God’s hands and not mine. I AM a fierce hearted woman. Not always understood,not always accepted, but I am a Fierce hearted woman. Thank you for this devotion today. It seemed hand picked for my situation. May God bless you! I truly needed to read this today!!! I’ve been struggling to break free from certain people and things that hold me back ftom emracing life, love and faith. So I’d love to join Holley on this journey to becoming a fiercehearted woman and discover what she did: the freedom and courage to embrace life, love, and faith to the fullest because your struggles can no longer hold you back. I’m a fierce-hearted woman! My daughter has cancer and there are times I feel that she isolates and withdraws. In turn I find myself thinking I’m the only mother going thru this with an adult child. This devotion was refreshing as she has been withdrawing this week. Thank you for sharing! I .AM. A. FIERCE. HEARTED. WOMAN! I’m a fierce hearted woman but just started out on a new journey in my life……widowhood. I’m not liking it necessarily and I’m a bit scared BUT I am trusting God One moment at a time, one day at a time. I AM A FIERCE HEARTED WOMAN!! I am a fierce hearted woman, and I do have a tendency to hide behind cupcakes, flowers, and even smiles rather than talk. I need to let the woman inside out more and more! I’m a fierce hearted woman. God and I just completed breast cancer treatment and with no fear in each step. Thank you girls for your devotions, funny how every one touches home. “I don’t have to take care of everything and everyone all the time”… I am a fiercehearted woman. Thank you for sharing this today. I really needed to hear that I am not the only one. Blessings. I am trying to be a fierce hearted woman! I am working on being a fierce hearted woman! I’m a fierce hearted woman!!! I truly needed your post today. Thank you for always being able to “shake” some sense back in me. Thank you for today’s post. It was just what I needed. I am a fierce hearted woman. Love the phrase “you’re not the only one”…very powerful. I’m a fierce hearted woman. I am glad to hear that I am not the Only One. I have been trying to take care of everyone and of course failing miserably. Thank you for the needful reminder. Thank you for this lesson today. I needed it. I was struggling with a project I signed on for that is taking place tomorrow (Saturday), so this was so very timely for me – I am not the only One is perfect !! God’s reminders even come in wonderful email devotions! Thank you for sharing your story and giving me the encouragement needed to continue growing in Christ! Thanks for the message! As a mom we all try to do everything for everyone. Thank you Jesus for being our “Only One”…We need that reassurance today transitioning our child to sober living home from rehab. We have struggled with our daughters addiction for years but have finally released her to God for His Plan in His time…we hope this is the time she will grip God’s love go help her succeed through her addiction. She has to realize the “Only One” to help her is the One True Healer! Thru God the Father, Christ His Son, and The Gift of the Holy Spirit within me, I am a fierce hearted woman! Thank You, Lord! I have a womens ministry weekend! Very thankful for this word that could release me to look outward to love! I’m (trying to be…..) a “Fierce-Hearted” Woman! I am a fierce hearted woman! This devotion spoke to me today. I am not the only one. I’m a fierce hearted woman and I will take the everyday struggles of life head on! God is by my side and He will be overcome anything! This year has had a lot of struggles in my marriage .. Finances .. And a daughter fighting a battle against leukemia … A son and his wife fighting infertility .. And a bright side of a daughter expecting her first child … Being a fierce hearted woman has been important. Thank you so much for this word today it was exactly what I needed! I’m a fierce hearted woman trying to hold a marriage together. Wow! There are a lot of different messages in the phrase: You’re not the only one. Many messages and each one is a good lesson. Thank you for sharing her work. God bless! I’m a coerced hearted woman. I’m a fierced hearted woman. I have adopted 5 girls and am legal guardian to another who is 17. Two of my girls struggle with who they are in this world to a much deeper degree than the others. This book sounds like it would be a wonderful thing for them to read and understand that they are wonderful women as they are and they should embrace their strengths and their weaknesses that also make them strong. coming from someone other than mom would be great. I am a fierce hearted woman!! Loved this devo really needed these words this morning…Thank you!! I’m a fierce hearted woman, sometimes. Thank you! Yep…that’s me…afraid to volunteer because someone else will do it better than me! I’m buying this book! I am a fierce hearted woman as I face the spinal surgery Mon the 13th on my only child. I have already prayed God will show me someone who is in the waiting room going through what I will go through that I will be a blessing to them. I am a fierce-hearted woman! I’m a fierce hearted woman! I am not the only one and that’s for sure after reading this post! We may not have the answer , but we know WHO has the answer !! I AM A FIERCE HEARTED WOMAN!!! Edit….I AM A FIERCE HEARTED WOMAN!!! I am battling PTSD and it is extremely difficult but I am not alone. I am not the only one! I am working on becoming a fierce-hearted woman. One day at a time.. Thanks for letting us realize that we all struggle with these issues – some more than others. Thanks for reminding me that its not up to me to fix everything and to be everything. It was a much needed lesson ! “I’m a fierce hearted woman!” I have been dealing with work, home & my 86 year old Mother who had a stroke 4 weeks ago today. So yes I do feel like I am the only one. God had His hand on her and she is doing great. Thank you for the devotion today. It encouraged me to know that I’m not the only one who is going through things but that I can lean on The Only One who is healing me with it all. I am strong through he Lord. I’m a fierce hearted woman through Jesus Christ. I am learning to lean on him for every need. I’m a fierce hearted woman! It’s hard to be vulnerable and admit that we feel “less-than” but when we do, so many others join in the chorus. I’m a fierce hearted woman! Some days better than others, lol. I am a fierce hearted woman. I would love to read this book. I always think I am the only one who is struggling to live the Christian life. I’m a fierce hearted woman who refuses to give up on God and His promise to restore my family. I’m a Fierce Hearted Woman!! Thank you for reminding me of that and reminding me that I don’t have to be everything to everyone! I am working through a life transition–thank you for the reminder that I’m not the only one. I’m a fierce hearted woman…..well, working on it, anyway! Praise the Lord for his grace! Oh my goodness, goodness! As I read this I began to find comfort, and then massive waves of anxiety. Today, this very day, my life will change drastically. For the good, but I am so afraid. Your share reminded me I’m not the only one. Jesus, my Savior is here with me. I am a fierce hearted woman (said me never…but I’m working on it)! I am a fierce hearted woman! “I’m a fierce hearted woman!” – My husband had Biopsies done yesterday on nodules on both sides of his Thyroid, results between today and tues am. I know Jesus is at my side waiting with me. I very much want to be a fiercehearted woman – to the glory and honor of God! Thank you for sharing, Sharon and Holley. May God continue to bless you richly. I always find encouragement in your posts. I’m a Fierce-hearted Woman! And I’m not the only one! Thanks for just giving insight. Love reading this as I seek God. I have been supporting my sister through her painful divorce. This was so helpful. As soon as I read those words-you’re not the only one…my heart quieted. Ahhhh relief. Solace. I am a fierce hearted woman!! Recently- through an unplanned chain of events- my 86 year old mother has come to live with us- to say this was a sharp right turn in my life plans is an understatement- but God is showing me that His plans are bigger than mine- and that I am stronger than I thought or ever imagined I could be- but not without His help. Thank you for being so honest about your fears, if we as women were real about ourselves and lifted each other up every day it would make a difference one woman at a time. I have tried to teach my daughters to commend a woman who they run across who is talented or gifted, rather than first find her flaws because of our own insecurities in ourselves. We are all imperfect, and in that way it makes us perfect especially when we are honest. I’m a thankful fierce hearted woman!!!!! As I’m drinking my prep for a colonoscopy!!!!! Yes, fierce hearted for sure!!! Praise you, Lord Jesus!! Thank you so much for this! My daughter has a brain tumor. I want to be a fierce hearted woman. Teach me, help me to become a fierce hearted woman!!! I am not the only one dealing with this. I am a fierce hearted woman! It seems like I struggle every day but I hide it so well. I look so put together on the outside but feel so falling apart on the inside. I feel like a failure, I quit my job to try and help with my Mom then she moved in with my Sister and her family, now I still am without a job. I pray continuously and am trusting Him but that small.voice of doubt likes to creep.in and cause the fear and doubt. I want to be self sufficient again and depend on myself for my own support. I know you get told this often, but girl, I love you and appreciate your messages. I need to be fierce hearted right now…my husband is in recovery for alcoholism and started a layoff today. I am working fulltime and caring for my daughter with down syndrome. I am loaded down with a need for God to empower me to give me some hope and strength. I am desperate for courage and strength to be a good supportive wife, caring mother and to find some time for self care. I too have experienced struggles along the way in life. I live with guilt and the fear of not being enough. I am ready to reclaim me. I am a fierce hearted woman. Wow, what an encouraging word, to know that I am not the only one. I’m a fierce hearted woman! I am not the only one!! I am a fierce hearted woman! Struggling with anxiety and depression is hard to deal with, but my faith is stronger. I enjoy receiving these emails. They make me want to fight harder to win my battle. I LOVE seeing all of you wonderful women saying that you are indeed fiercehearted. And you are! I am totally blind & it’s very hard when I can’t go & do whenever I want to & when I have to ask for help sometimes. I am very independent but when I read this it made me sit down & think that Jesus is always here for me through the good times and the difficult times. He has made me a Fierce Hearted Woman!!! Thank you Jesus!!! I am a fierce hearted woman! Thank you for those encouraging words. What a relief it should be to know we aren’t the only one!!! I AM a fierce hearted woman!! I AM A FIERCEHEARTED WOMAN! I AM a FIERCE HEARTED WOMAN and I can do ALL THINGS through CHRIST who STRENGTHENS ME!! But I don’t have to do ALL things only HE can!! Thank you for this reminder today!! I’m a fierce hearted woman! Thank you for reminding me of that!! I’m a fierce hearted woman, even thought soft spoken! Thanks for uplifting message. Will share!!! Women need women. I didn’t trust be you are showing I need to. Wow, does our Lord Jesus know exactly what we need to hear at the exact time in our lives, to him be the glory! Amen! I am a fierce-hearted women through Christ who strengthens me. Amen! Amen! Amen! No, we’re not the only one. Perhaps we need to give more consideration to others and their problems and then ours wouldn’t seem so impossible to overcome! You better believe I’m a fierce hearted women because I know who’s got my back! I am a fierce hearted woman. Jesus, please allow me to allow You to make me the fierce hearted woman You want/plan for me to be. I’m a fierce hearted women! Its true. I’m not the only one. And some have it worse than i. Thanks for this great reminder! I’m a fierce-hearted woman! I’m a fierce hearted woman. Thank you for that devotion! I look forward to reading the book! I am thankful I am not the Only One!! I don’t want to have to save the world! Amen!! Through Gods grace and mercy, my marriage of 22 years, almost ended in divorce a year and a half ago. I had figured out that my husband was having an affair (with a girl from work and, she’s 16 years younger than him). I was heartbroken and still struggle but through Christian counseling that we both did and fervent prayers, our marriage has been better than it ever has. I can’t imagine my life or my marriage without God and my husband. And our beautiful daughter (22 yrs old) and amazing son (18 yrs old) The enemy will not win this battle!! It’s already been won by the blood of Jesus!! I am a fierce woman! I needed to read this message to be reminded of who I am in Jesus Christ. Thank you. Jesus really cares about you. My eyes are always on you. Bless these women every day. You love us as we are. This is my prayers for all. 2006 Accident, lost my voice, Love, my language. I have been doing a link up with Coffee For You Heart, I love Holley’s work. Because God has not given us the spirit of fear I can gladly state that I’m a fierce-hearted woman! I WANT TO BE a fierce hearted woman !!! Some of my Twitter followers might like this article. “I’m a fierce-hearted woman!” by faith! I needed to hear that, you get it, sharon. God bless! God knows! Message was what I needed. Thank you. I’m learning to trust more in God’s sovereignty and His mercy and not try to figure things out on my own…knowing that He controls my life, this world, and everything that happens. That He is always working for my good and His glory! I am a fierce hearted woman!…well, I want to be. “Thank You”. I AM NOT THE ONLY ONE and I’M NOT ALONE, I needed the reminder that I don’t need to solve every problem or issue. I serve an AWESOME GOD! I am a fierce hearted woma. You will never know how much I needed this post at 1:39 this Saturday morning. Thank you! “I’m a fierce hearted woman!” Thank you for sharing these words Holley and Sharon. Wow this was a good one! I would love this book to remind me in the tough days who I am . I’m a fierce hearted woman! Please, God, help me remember this and live it out. I am a fierce hearted woman the precious daughter of a fiercely loving God! Oh how I could use this wonderful book! I am strong, but often guilty ridden. I am not fierce-hearted, but am gentle hearted. So I struggle with myself because I just can’t imagine just how much God loves me, yet the word of God testifies that He truly does. I loved the devotional on the rooster. Survived a flood and loss of home. God is building beauty from ashes. I’m a fierce hearted woman.